Suitable for serious applications as well as more playful designs, FS Irwin is the latest must-have typeface from Fontsmith. It's always a good idea to keep your design armoury well-stocked with fresh fonts, and the latest typeface from London-based type foundry Fontsmith looks like a the perfect addition to your collection of professional fonts. 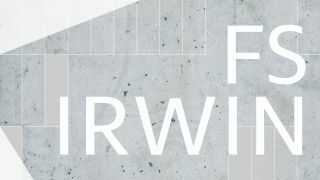 FS Irwin is a text-oriented, humanist sans-serif. It was created by Fontsmith's senior designer Fernando Mello, and inspired by New York and his time studying typeface design at the Cooper Union's five-week Cooper Condensed Program. The brief was for a clear yet unique typeface that could communicate well, while avoiding loud and overtly mannered design structure. Mello started off by studying inscriptional lettering and doing calligraphic exercises, before going digital and adapting this approach into a more workable, humanist sans-serif structure. His work was influenced by the bold, in-your-face style of the New York subway font, but evolved into something quite different while still capturing its spirit. "In a similar way to London, New York is so mixed and so cosmopolitan," says Mello. "I was amazed by the different styles and identities I saw there, and tried to encapsulate this essence to create something new, relevant and very now." Mello started work on FS Irwin in 2014, and the team at Fontsmith has been refining it ever since. Described by Fontsmith as a typeface that conveys quality design and simplicity rather than focusing on quirks or distinctive characteristics, FS Irwin's proportions and details mean it is adaptable across any situation or application – from more playful designs to serious corporate identities – thanks to a welcoming, yet sincere tone. FS Irwin comes in 12 weights to suit all your needs; you can buy individual weights for £15 each, or the entire family for £180. To find out more, head over to the Fontsmith site.